Have you ever tolerated hunger? Have you ever observed fast? How precious the food can be after fast!! Today many kids are not getting food, so they start working or begging. Their future seems dark, with addictions like smoking, drinking liquor etc. When they grown up, they remain illiterate and counted as burden to the society, that bring down the economic growth of the nation. Few of them may become criminal too. How about, a kid getting nice delicious SATVIK meal at the school itself! It will prevent child labor. He will perform well in his study. After growing up, he will become a responsible citizen and build a bright future for the nation. The educated child can save the family from poverty, superstition and unhealthy addictions. We can address the issue at grass root level and eliminate the poverty and illiteracy, if we provide nutritious food to the children. What do you say? The Government already running schmes like mid-day meal. However many times NGOs are more effective than government. ISKON is one such NGO that feeding a meal everyday to school going, less privileged kids under "AkshayaPatra" project for last 10 years. ISKON started this with 1500 students at nearby schools. Today ISKON is feeding 1.3 million students daily. The "AkshayaPatra" project is still growing with ambition to feed 5 million children by year 2020. We Indians are used to keep food aside for animals and for less privileged people, before we start our meal. It is our tradition. The resources are not constraint. Someone just need to start with good intention and determination. ISKON is just channelizing our resources for a noble cause of food for school students for their better education. The project needs money, to sustain and to expand the reach. ISKON volunteers have faith in goodness at heart of people like us. Don't you think, we should support such project? Providing food to school students covers (1) food donation and (2) knowledge donation together. How can we support this initiative? In fact, donation may not be a proper word, we are just performing our social duty. I transferred nominal amount online for this project, and very next day, I got scan copy of the receipt by e-mail. We can trust such orgnisation like ISKON, for proper utilization of our money. We are not helping anyone. We are just sharing our wealth, that the almighty has blessed us. ISKON is providing us the platform to serve the mankind. This activity gives us a tremendous pleasure and satisfaction, that shopping of luxury items cannot give. ISKON promoted the AkshayaPatra project with social media also like blogging, facebook, orkut, twitter. Today, many people are unaware about "AkshayaPatra". 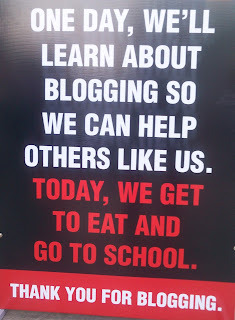 We all bloggers had IndiBlogger meeting on 9th Jan, 2011 at ISKON temple Bangalore. 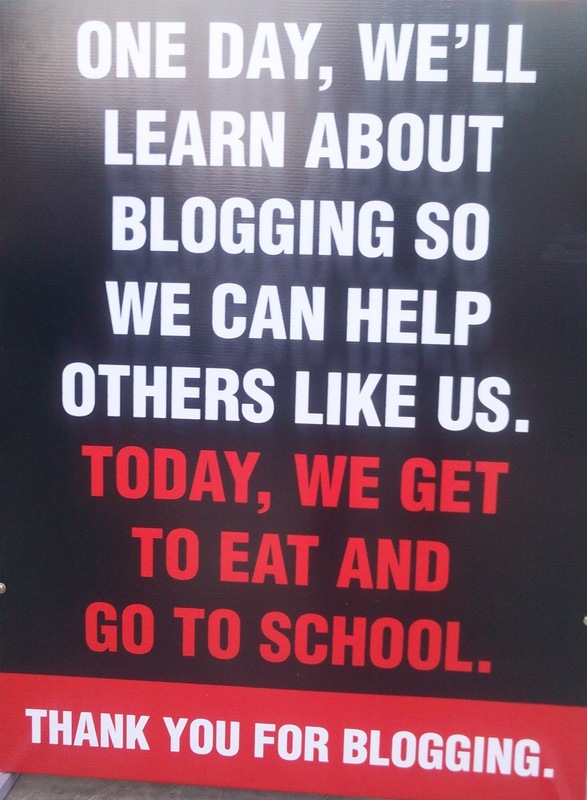 We almost 120 bloggers wrote about it and the AkshayaPatra website hits increase from 1500 per month to 4500 per day. Let’s all spread the words. Let me conlude with this nice poster at the venue. Thanks for stopping at my blog and contributing for AkshayaPatra.We can make a big difference to the society at large. We heard in Ramayana a small squirrel was helping lord Rama to build bridge over the sea. That divine spirit can do wonders and it worth more than millions of rupees. great to see people are putting efforts for the noble cause. You are really a great person.. Your efforts will count for sure..
And Happy to meet you in IndiMeet.. Here is my writeup on IndiMeet, Wow! What a day! Nice post Manish. I am glad to know about this. Nice to know about your donation too. Keep doing such good work. Can I publish this post on my blog with yr blog reference?